Cryptosporidium on holiday what is lurking in the pool? Cooling off in the hotel swimming pool is one of the most popular pastimes amongst holidaymakers abroad. Yet if pools are not cleaned or maintained properly, illnesses such as E. coli, cryptosporidium, giardiasis and shigella can occur. This can lead to experiencing symptoms of vomiting, stomach cramps and diarrhoea. Many of these infections often affect children as they spend so much time in the water. Have you or your child/children suffered cryptosporidium on holiday? 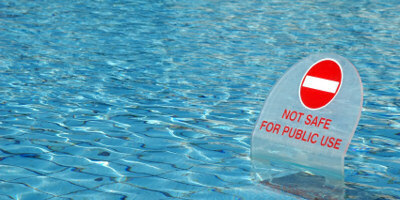 Swimming pool water contamination commonly occurs when parasites or bacteria enter the water. When water becomes contaminated with faecal matter, a wide range of infections can follow and large swimming pools at all inclusive hotels and water parks often harbour bacteria which cause illness. When contaminated water is swallowed it can cause gastric illness and eye, ear and wound infections are also common after swimming in a dirty pool. You cannot see the bottom of the pool. The pool smells strongly of chemicals. The tiles are slimy to the touch. In the past few years, there have been some major outbreaks of cryptosporidiosis in package holiday hotels and it has often been necessary for tour operators to demand that hoteliers close, empty and clean swimming pools. Expensive legal or insurance claims have been made against both the hotel and the tour operator. If you have contracted cryptosporidium on holiday as a result of poor hygiene within a hotel swimming pool, we are on hand to help you. We understand that a holiday illness is distressing enough. That is why it is our aim to help you claim the maximum holiday illness compensation you deserve. Our holiday illness claims team has over 50 years combined experience within the travel law industry. They have the background knowledge and expertise to help you obtain the best possible outcome for your claim. To speak directly to a holiday illness claims expert, call us on 0800 01 54321 or simply complete the online contact form to arrange a quick call-back.